Jalapeno poppers are a very popular appetizer in restaurants. The little hot peppers are hollowed out, filled with a creamy, cheesy mixture, then they are deep fried until the peppers are crisp and the filling is melted and smooth. This recipe is pretty easy to make at home; it's just a bit fussy. Take your time and enjoy the process. There are many options for how you prepare jalapeno poppers. You can make them ahead of time and when you are ready to eat them, reheat them in the oven. If you prefer, you can bypass deep frying them and bake them instead. You can prep them in advance, stuff them, and freeze them without cooking. When ready to eat them, allot yourself 30 minutes to bake them. The No. 1 thing to remember is that if you plan to prepare them ahead of time, you will want to freeze them without frying them. 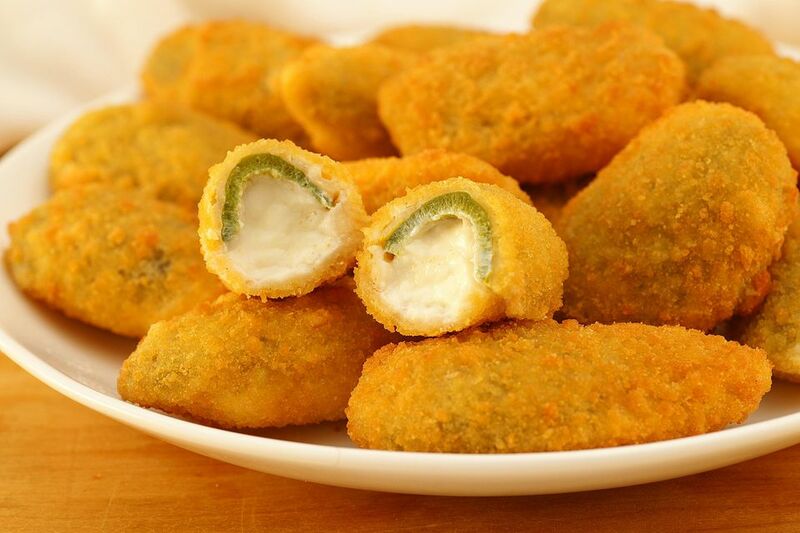 The name "jalapeno poppers" first took hold in the 1990s. Jalapeno poppers were first called armadillo eggs in Texas in the 1970s. They are a Tex-Mex variation of chile relleno, or "stuffed chile," a popular Mexican dish. Be very careful when halving and seeding the peppers. Use rubber gloves and do not touch your eyes while you are working with jalapenos or any hot peppers. In a medium bowl, combine the cream cheese, oregano, chili powder, and pepper jack cheese; blend well. In a pot of simmering water, blanch the pepper halves for 2 minutes, then drain and dry thoroughly with paper towels. Spoon the cream cheese mixture into the blanched jalapeno pepper halves. Combine the milk and egg in one bowl; in another shallow bowl combine the flour and salt. Dip the stuffed jalapenos first into the milk then into the flour mixture, making sure they are thoroughly coated. Place the coated jalapenos on wire racks and let dry for about 10 minutes. Dip the jalapenos in the milk mixture again and then roll them in breadcrumbs to coat. Let the coated peppers dry for 30 to 40 minutes, repeating the dipping in milk and rolling in breadcrumbs if necessary. In a large and deep heavy skillet, heat the oil to 365 F. Deep fry the filled and coated jalapeno peppers 2 to 4 minutes each, until golden brown. Remove and let drain on a paper towel. To freeze, do not fry the peppers. Place on a cookie sheet and freeze until hard, then package in a single layer in plastic freezer containers. To eat, place on cookie sheets and bake at 350 F for 20 to 30 minutes until hot all the way through, golden brown, and crisp. Or you can fry the frozen poppers; just add 1 to 2 minutes to the frying time if they were frozen.